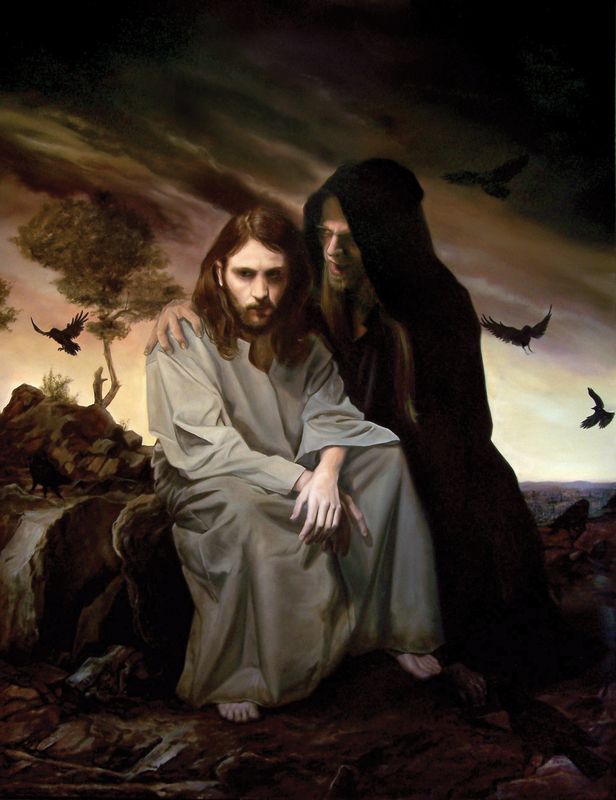 Here is an image worthy of Lenten reflection: James Tissot’s 19th century portrayal of Jesus’ Second Temptation. Hovering over the Jerusalem Temple, we see starkly contrasting figures ~ the bodiless tempter, with an anger-filled face; and the serenely embodied Jesus, whose focus is within. “If you are the Son of God…” Why would those words have any power over Jesus? Perhaps it’s because they echo something said earlier in the Gospel. For we hear essentially the same words at his Baptism. “Just as he came up from the water… a voice from heaven said, ‘This is my Son, the beloved…’” A voice from heaven declares that this man, born to a village carpenter, is in fact God’s own Son. We need not have grown up in modern times to consider this claim improbable. Many of Jesus’ own contemporaries considered the statement far-fetched, and even blasphemous. Jesus, himself, may have wondered at this. He probably had had strong youthful premonitions, that God had marked him for a special vocation. But, it’s unlikely he would have imagined there was something unique about his personal being, rather than more simply a difference in the kind of activity to which he was being called. And so, as he came up from the Jordan waters and heard those now-familiar words, he may have wondered what was really being said. Then he finds himself alone in the desert… It must have felt like “now or never!” A childhood and young adult life shaped by a genuine piety, and full of Spirit-prompted intuitions. And then, in the wilderness, all is tested. And not for the last time! Tissot’s image captures a self-possessed Jesus, and we can assume it’s a faithful portrayal of his character. A significant part of Jesus’ self-possession stems from the fact that he is not captive to others, and not captive to possessions. Self-possession is focussed within; possession by things and by other people happens when we are distracted by what is around us. And so, self-possession is an antidote to being possessed by our possessions. Self-possession makes possible self-giving. This is why we distinguish self-possession from self-absorption. For self-possession and self-giving are natural and spiritual corollaries. In his vocation, and especially in his Passion and Death, Jesus exemplified self-giving. This blog is based on my sermon for Lent 1, the text of which can be found by clicking here. The James Tissot image comes from the archive of his biblical artwork, which is physically maintained at, and digitally available from, the Brooklyn Museum. Observers may note what appears (by contemporary standards) to be a culturally insensitive rendering of both the Tempter and of Jesus. Taking this point into account (while also appreciating the artist’s effort to depict matters historically and contextually), we can still benefit from Tissot’s biblically faithful work.